Launceston, Tasmania was the host city for this most prestigious biennial Easter event on the Australian SOBHD dancing calendar. Eight adjudicators from Australia were joined by two internationals to adjudicate the almost 350 competitors who came from throughout Australia, New Zealand and Canada.The judges for the two day events were Anne Andrews from USA, Lesley Bowman from Scotland and Australian judges Bev Dickson, Dianne Harrison, Tracey Heazlett, Beryl Leslie, Craig Lindsay, Graham McKane, Robyn Newton and Sue-Ellen Proctor. Judges were given chair covers alphabetically numbered from A - J to identify them. Australian pipers Graeme Hardy, James McDonald, Callum McGinn and Ian Puller had an extremely busy weekend piping for 7 platforms of competitors and a Guinness at the end of the event was extremely welcomed! Absolutely brilliant weather for both days gave the organisers (the Tasmanian Regional Committee of Highland Dancing Inc) a sigh of relief - as always with an outdoor competition, the prospect of moving in the event of inclement weather is very daunting. However, a contingency plan had been put into place but fortunately not required. Pre-Premiers were able to obtain their dancer numbers from their first-event platform which reduced considerably the numbers to wait in line, so dancing got off to an early morning 8am start with the Premier Trophy Dance jigs - just the go for warming up those that hadn't! Unfortunately judge Lesley Bowman was feeling a little ill the first morning (and we were praying we hadn't poisoned her at the prior evening's Welcome Cocktail Party!) but a few doses of some Tassie medicine, plus a stalwart Scottish constitution and all went full steam ahead. (Lesley put us all to shame on the Sunday by arriving in the most beautiful Lorne tartan outfit with matching electric blue accessories and looked a million dollars - wow! ) Mind you, I spent 10 minutes worrying about whether I should put a covering over the grass on the oval so her beautiful blue heels didn't disappear into the soft turf, but it's amazing how a dancer can walk without sinking!! The Friday evening Cocktail Party had commenced with champagne at the dancing platforms before moving into a nearby conference centre for nibbles, the usual round of welcome speeches and the opportunity for the guests to catch up with interstate and overseas friends. Warm congratulations were given to the immediate past President of the Australian Board, Mrs Nancy Kennedy and her husband Robert on the attainment of 50 years marriage - a Golden Wedding celebration to commence a golden weekend of competition! It was lovely to see several current members of the ABHDI headed by President Margaret Paterson in attendance for the whole weekend as well. TRCHDI President Helen Moir responded to the welcome from newly elected city Mayor Ald Janie Dickenson. 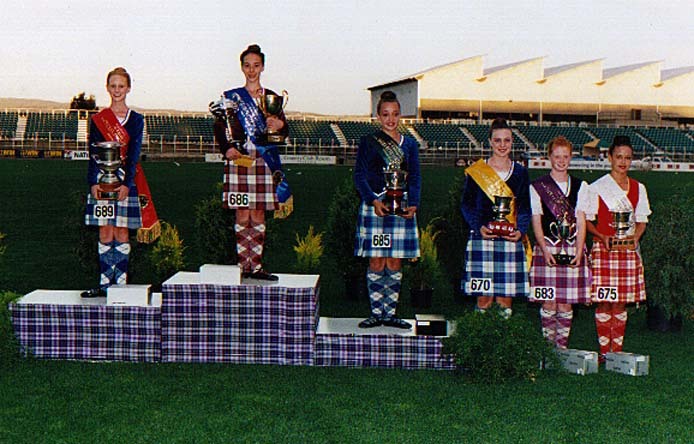 The seven platforms were initially fully in use with the 10 judges rotating with the completion of each event - this gave variety to both judges and competitors and the opportunity for a break to each judge. Volunteer marshals were kept busy with checking off and staging competitors, provision of resin, laying swords, allocating flags for placings awarded and so on all under the guidance of Chief Marshal Gaye Anderson. Scrutineering teams were busy with number allocation, result checking, card marking, medal and trophy dance award allocation, collation and display of results as well as the scrutineering of all aggregates, titles and Championships. These teams were under the guidance of yours truly,( Ngaire Glover) Vice President as well as Chief Scrutineer. Gaye and I will never be able to thank all these people who worked so hard for us, quite enough! A variety of trophies had been purchased by the ,'Trophy Team' of Treasurer Beth Pettrey and Committee member Sarah Foster and these were displayed to their full advantage in the presentation area. Complimentary comments were received on the quality of the prizes, particularly those featuring Tasmanian wood/s. Given both these ladies also competed over the weekend, their organisation of the trophies was impeccable. The special medals struck for the occasion were made in Tasmanian by Artesia Pewter of Hobart and arranged by Dancer's Registrar Isobel Williams. The design included dancing shoes representing highland dancing and the Tasmanian Blue Gum as the floral emblem of Tasmania. 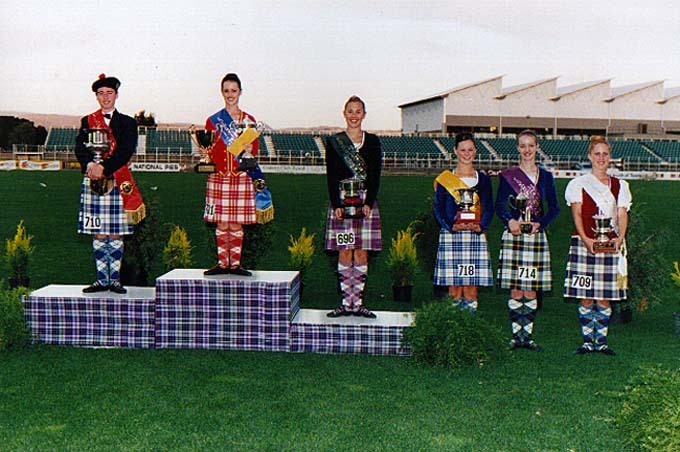 Presentations of aggregates and titles were completed as available throughout the days, leaving the presentations of the 5 Celtic Festival Championships on the Saturday and the 3 Champion of Champions Championships on the Sunday until last. An event of this nature could not be conducted without volunteers - they were just fantastic! Many people were involved in erecting the platforms, making numbers, selling programs and merchandise and the myriad of things which go with the running of such an event. Mums, dads, friends, rellies, kids, former dancers, you name it! As always, a lot of the queries ended up at the office of Secretary Margaret East who was kept from sitting down for most of the two days! Everyone was most grateful for the work of the wonderful volunteers 'tho and President Helen Moir presented all the volunteers with a certificate of appreciation and a bronze Championship medal. Merchandise organiser and logo designer Technical Secretary Kim Roe was elated in that stock was completely sold out by the end of the weekend but fortunately orders were able to be taken for more, so everyone should eventually be satisfied with a memento of the occasion. Kim was also the organiser of the finale concert, but more on that a little later. The change from daylight saving to Eastern Australian Standard Time in the wee hours of Sunday morning brought a welcome extra hour's sleep (especially to those of us who were still up preparing judging sheets at the time!) Complementing the dancing was a "Celtic Festival" organised by a committee under the leadership of Peter Daniel (Kim Roe's partner). As well as some fine food, wine and celtic craft stalls, the crowd was entertained by the Tartan Warriors, the Derwent Scottish and St Andrews Pipe Bands, a mixed team of Scottish Country Dancers, the West Tamar Municipal Band, several buskers and The Muttley Crew. The latter being a performing troupe of eleven dogs of various origin with their handlers, but certainly very entertaining. However, the Tartan Warriors certainly drew the crowd with their show of brute strength. The events they conducted were awesome - from lifting five stones on to the top of barrels which were placed 5 metres apart with the stones getting progressively heavier (the last weighing over 140kgs), all as a timed event to an event which could only be termed as 3 small events in one - load 4 barrels on to the back of a truck, run around to the front of the vehicle, remove a huge tyre and then push the vehicle 10 metres - whew!!!! Thank goodness for Irish Murphy's pub serving the Guinness (amongst other things) nearby, together with a beaut celtic band. Sunday hailed the running of the Scottish Hill Run from York Park and return - a choice of 2km or 5km course and there were plenty of kilted 'mad Jimmy's' running, drawing hoots of laughter from the crowd as they made their return to the finishing line in the centre of the oval. The much-awaited presentation to the Champion of Champions Championship placegetters was fortunately held in brilliant sunshine on the Sunday and as each placegetter in each individual dance was announced, the crowd showed their appreciation of the dancer's efforts by applauding each and every one. Judges shared the sashing and trophy presentation to the recipients. The 'Australia Cup' was presented to the highest placed Australian dancer in each Championship by Mrs Margaret Reichelt of Mt Gambier who is the daughter of the late Mr Frank Cleves, the initiator and instigator of the Champion of Champions Championship of Australia. The results of both days' competition is available on the TRCHDI's web site: www.trchdi.org.au together with some pictures of the Champion of Champions placegetters. A Gala Celtic Concert organised and coordinated by Kim Roe held on the Sunday evening at Launceston's Princess Theatre was the finale to the weekend. Choreographed items performed by the Kim Roe School of Dance of Launceston, Jacqueline Jones's Cooper School of Highland Dancing from Perth Western Australia, Margaret Paterson and Ellen Sommerville's Thistle Studio from Brisbane Queensland and Veronica Law's (McFarland) Highland Dance School from Gosford New South Wales were really great, as was the celtic harpist and the very entertaining St Andrew's Pipe Band of Launceston who performed some of their items from their Celtic Force Concert. The highlight of the evening was the performance of a Sean Triubhas by the 3 Champion of Champions winners, Lourdes Zalewski, Rebecca Fleming and Sarah Johnston followed by a Highland Fling with the remaining placegetters. I don't think anyone who attended the concert will forget as the curtain rose, the wonderful display of 16 of the Champions wearing their sashes and displaying their trophies and then moving to perform - truly magnificent! (I'll admit a wee tear as I watched my student). Well, I know that a few Guinness, wines, whiskeys, G and T's etc etc were consumed after all that (and who can blame anyone for doing so), but I'm not going to tell any stories of who of the 9 of the excellent company helped me empty the bar in my suite, complimented each other on their excellent adjudication/ teaching/efforts or made me laugh so much my jaw was aching and finally let me go to bed so I could get up early and take one daughter and partner to the early flight out. Great night! However, I will urge everyone to come to the next Champion of Champions of Australia to be held in Victoria Australia Easter 2004 and share the re-acquaintance of old friends, the gaining of new friends and most of all in the pleasure of dance. Well done everyone and good luck to the VSCHD for 2004!!! !.